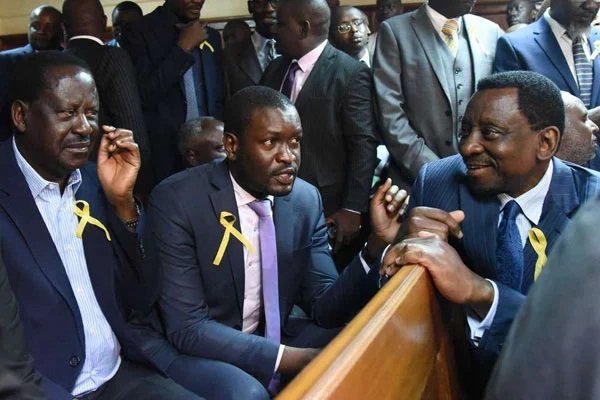 Wednesday April 17, 2019 - Orange Democratic Movement (ODM) party leader, Raila Odinga, is not happy with the conduct of Siaya Senator, James Orengo, and his party’s Secretary General, Edwin Sifuna. According to impeccable sources, Raila summoned Orengo and Sifuna on Tuesday over the dismal performance of ODM candidates in the just concluded Embakasi South and Ugenya by-elections. Particularly, Odinga was unhappy with the approach used in Embakasi South and Ugenya Constituencies by-elections where ODM candidates were thrashed by unknown candidates. In the meeting held at Capitol Hill, Odinga scolded Orengo for 'reckless' utterances where he invoked the name of Deputy President William Ruto in many rallies. For Sifuna, Raila questioned his decision to issues party statements without consulting widely. He also questioned why Sifuna dragged Ruto's name into Embakasi South mini-poll. On the party’s internal intelligence, Raila asked Sifuna why he had not noticed the party's dwindling fortunes at the Coast. He specifically raised issues with Msambweni MP, Suleiman Dori, who he said may have lost touch with the ground despite surviving expulsion.